No Dots Down Here... 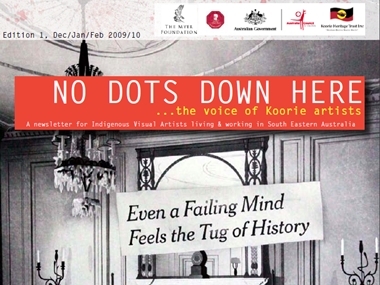 The Voice of Koorie Artists"
At the Koorie Heritage Trust's inaugural statewide visual artists gathering ground held in 2009 one of the key recommendations arising from the gathering was a need for a newsletter and network that would keep Koorie visual artists in touch, inspired, informed and empowered as a collective voice. No Dots Down Here is the response to that need.